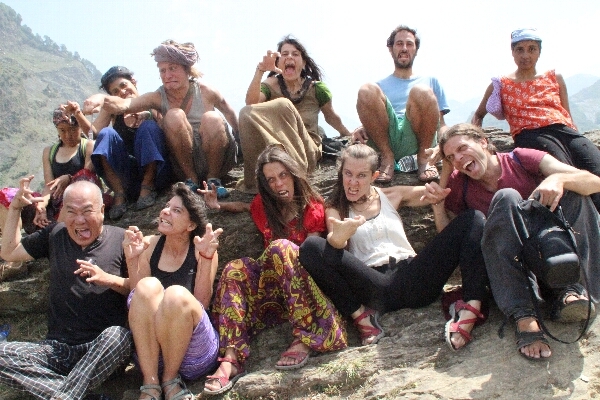 We went Kharotta Sactuary in Himalayas and Danced the Nomad Rhizome. at cool Himalaya, in this Summer! Here is 2000m hight from sea level. Temperature is very confortable about 20℃. We selected most important Butoh Techniques whih collected for the two decades, and study one technique in each day. For one month you can get 20 important Butoh techniques with Rhizome Lee and Pamela. Every day we study an important Butoh Technique..
For one month you can get 20 Butoh Techniques. All dancers exchanged the costumes each other. And also their personality or charactor have changed. They danced with becoming another charactors. It is also a way to be released from own ego and self. Every week someone envent unique ay of experiment. Each one remembered the strangest world Qualia in own life, and found a place to co-create the world with resonance. Each one invited a person by lotter to that place and approach to the person with the strange world Qualia. Everybody had to dance in the strange world of others. Hijikata wrote to dance in the many world changes in the "Bugs walk" and "Sick Dancing Princess". "A body continued to be eaten by the world"
"Support the world in the struggle between you and the world." So, we become the world. This is the way to release from the strong ego archetype and self bind toward to become Life.